These cupcakes have a coconut cupcake base and a pineapple cream cheese frosting. Topped with some shredded coconut and festive "skewer" of pineapple and a maraschino cherry, these just look like a fun summer treat - just as tropical as the ever-popular frozen drink. I spiked them with a little dark rum to make them extra fun. Make sure when you fill the liners for these cupcakes that you don't fill them too full - I had a bit of a problem with the cupcakes running over the edges because they don't puff up as much as others. If you stick with filling the liners just 2/3 of the way full, you should be fine. Preheat oven to 350 degrees and line 18 muffin cups with paper liners. Sift together flour, baking powder and salt in a medium bowl and set aside. In a mixing bowl, beat butter until smooth and creamy, gradually add the sugar, beating until light and fluffy about 2-3 minutes. Combine the milk, rum, vanilla and coconut extracts in a large measuring cup. Add 1/3 of the flour mixture to the batter, mixing on low until just incorporated. Add 1/2 the milk mixture and mix until incorporated. Continue alternating with the flour and milk, ending with the flour mixture. Add coconut to the batter and stir in. Transfer to a separate bowl and clean mixing bowl if necessary to beat egg whites. In a clean mixing bowl, use mixer fitter with the whisk attachment to beat egg whites. Start on low speed and increase speed gradually as egg whites thicken, beating until they form stiff peaks. Fold in 1/3 of the egg whites to lighten batter, once incorporated, add remaining egg whites and fold gently until smooth. Transfer batter to prepared pans, filling each liner approximately 2/3 of the way full. Bake about 15 minutes, until a toothpick inserted in the center comes out clean. Cool 5-10 minutes in the pan and then transfer to a wire rack to cool completely. In a food processor, puree pineapple until smooth. Add cream cheese and butter to mixing bowl and beat until smooth and creamy, about 2 minutes. Add rum and mix in until incorpated. Add powdered sugar, one cup at a time, mixing on low speed until incorporated. Add pineapple, you may not need all of it, start with about 1/2 cup and add more as necessary. The frosting will be a little thinner than a normal buttercream, you can refrigerate to help it set up a little before frosting. I frosted these with a spatula rather than piping the frosting on. 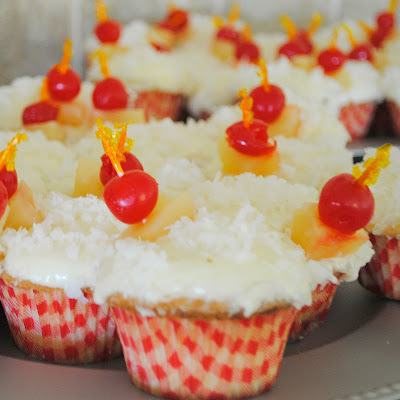 Top with shredded coconut and garnish with pineapple and maraschino cherry skewer if desired. I love the addition of rum!! A cocktail in cupcake form! I love it. Just looking at them makes me think of the beach. They look great!